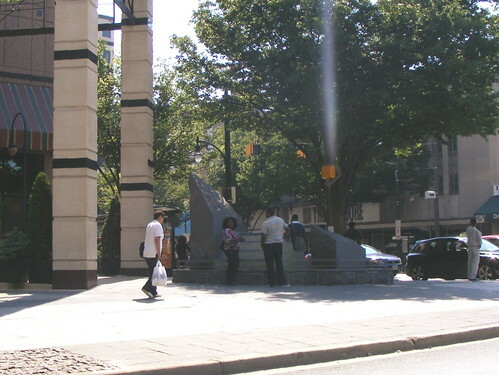 This fountain at Colesville and Fenton will be removed, making the entrance to City Place more visible. Like most enclosed malls in an urban setting, City Place's biggest flaw is that it presents big blank walls to the street, meaning that pedestrians who don't know what's in there aren't given a reason to go inside. That's what owners Petrie Ross Ventures seek to fix about City Place in the first phase of a major renovation, approved by the Montgomery County Planning Board last Thursday. Nighttime (left) and daytime (right) views of the new City Place entrance at Colesville and Fenton. All images taken from the Planning Department's report. They want to renovate the plaza at the corner of Colesville Road and Fenton Street, the mall's most visible entrance but perhaps also its most foreboding. Signs for anchor stores Marshalls and Burlington Coat Factory are plastered several stories up, making them hard to see for people on foot or driving past. A large sculptural fountain, lined with spiky strips to discourage loitering, blocks the door. A plan of the new plaza. 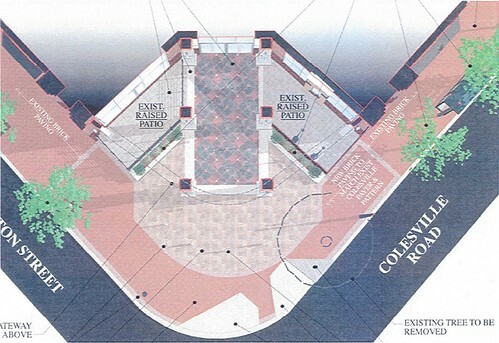 The developer's proposal would take out the fountain and repave the entire plaza, making it easier for people to circulate and open up sight lines. This will hopefully discourage loitering and make the space feel safer. A tree that interferes with wheelchair ramps at the crosswalk for Colesville Road will be removed. And a new metal screen, similar to the ones placed along Ellsworth Drive and Fenton Street in 2005, will wrap around the corner. It'll display large tenant signs, a new sign for the mall itself, and a video screen "that will televise events, ads and information as an aesthetic response to this admittedly commercial enterprise," according to a report filed by Planning staff. The screen will be required to display public information and event calendars every five minutes. The proposal doesn't address any changes to the restaurants flanking the entrance, Taste of Morocco and a shuttered Ruby Tuesday that was vandalized in the fall of 2008. Both eateries' street-facing windows are either covered up or tinted, and their patio seating - a great way to activate the plaza - is largely unused. Hopefully, renovating the plaza will encourage at least Taste of Morocco to open up to the outside. 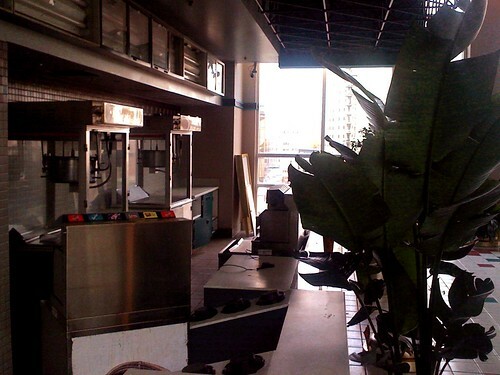 The ten-screen movie theatre atop City Place, closed since 2004, could be converted to offices. A new plaza is only the beginning of ambitious changes planned by Petrie Ross. 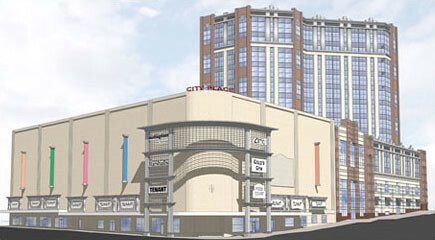 Parts of City Place's upper two floors, occupied by a ten-screen movie theatre that closed in 2004, could be converted to offices. 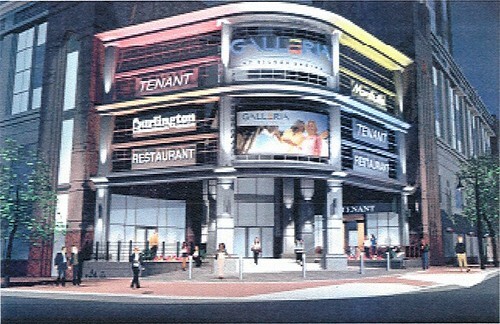 Signs around the mall already advertise the yet-unbuilt space for rent, and a flyer from the leasing agency shows how the building would be retrofitted - both inside, where the theatre would be gutted, and outside, where new windows would be added to the upper stories - to accomodate the renovations. 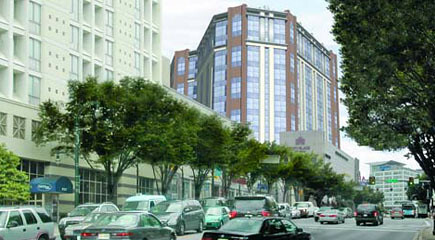 Renderings of the renovated mall and office tower addition, seen from the corner of Fenton and Ellsworth (left) and Colesville Road (right). The office addition, both within the existing mall and in a nine-story office building on top that was first approved twenty years ago, brings a customer base that could draw new, higher-end retailers to City Place. As recently as last summer, the developers had unsuccessfully courted Park and Planning to occupy the 300,000-square foot tower. But without office tenants willing to take a chance on the mall's potential turnaround, it's likely that nothing could happen at all. In the meantime, there's a possibility that City Place Mall could get a new name. 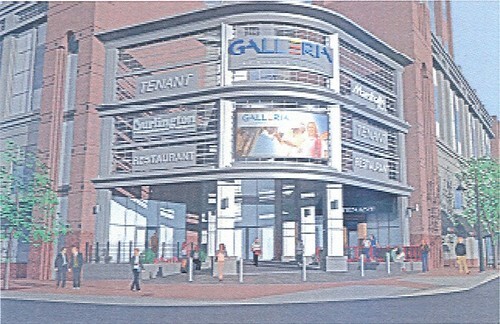 All of the renderings above show new signage at the corner of Colesville and Fenton reading "The Galleria at Silver Spring." As Silver Spring, Singular first suggested in 2006, the name City Place carries with it some serious baggage and could use a new moniker to get disenchanted shoppers interested again. Nice reporting. Looks like a winner to me, especially with the Fillmore coming in. The real problem is that Downtown Silver Spring is developing into a real urban destination, which isn't always conducive to hermetically sealed shopping experiences. Office and/or apartments would have been a better option, but I don't know how conducive the original architecture would be to those changes. Perhaps the real key is to minimize the visual divide between the Ellsworth st. outdoor shops and the indoor shops. On that side, the entrance is a staircase and a nondescript door. Perhaps the stairs could be a brick ramp to larger doors with the same color themes continuing in the building. Walking through the mall could be the same as walking down Fenton, except nicer when the weather is bad. Perhaps a larger entrance/exit near Gold's Gym would also mean the mall could be used as another diagonal path. Right now there's little reason to enter the mall expect to go to specific stores. Making it a useful and inviting through-path would get more feet inside. Shame about removing the fountain, as little kids really love playing in it. As for the renovations to the entrance, it's all well and good, but without stores inside that attract new customers, it's merely putting lipstick on a pig. Windows or not, there is nothing in that mall right now that interests me. Perhaps Petrie Ross feels that news stores won't come in without a new entrance. Time will tell. Mea culpa. Wrong fountain. Yes, take out that obstacle by all means. Good move. "...has a mix of discount and off-brand stores that attract shoppers from across the region but aren't relevant to well-heeled people living in the immediate area." From what I can gather the mall isn't attracting people from across the region, and it's not just not relevant to the well-heeled, I think it's not relevant to the average-heeled and many less than average-heeled. As Springvale Roader points out, until they do something with the tenants this mall is still going to be like the one in Dawn of the Dead (1978 version). Now quite possibly the idea behind all this renovation is to attract better tenants, but I'm not sure that sticking a video screen on the outside of the building is going to attract the kind of tenants that Silver Spring wants (Target, Bed Bath & Beyond, and dare I say it...Pottery Barn). Steve, you're absolutely right. This won't be enough to turn the mall around on its own, but from what I've been told by the developers, the goal is to reposition the mall (hence the name change) and try to pull in some higher-end tenants. The office tower will be a big part of this as well. But it's a chicken-or-egg thing: will office tenants take a chance on the mall, or will new retailers take a chance on offices that may or may not be built? 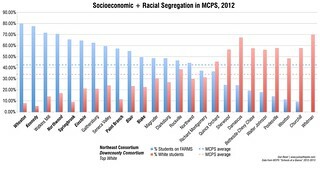 I try to shy away from statements like "what Silver Spring wants." The mall does do business from a segment of people, among them many Silver Spring residents. Target and Pottery Barn would both be very nice, but they haven't exactly gotten a mandate from the people to come here. It's because people don't go to Silver Spring to shop. They go to Silver Spring to eat, and to be entertained, a la the multiple movie theaters, live theater, bars, lounges, etc. 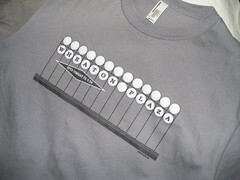 Most of the only shopping done in downtown Silver Spring is done in the supermarkets, convenience, and hardware stores. Even though Wheaton Plaza is in a sorry state these days, I'm sure it's still drawing retailers from downtown Silver Spring. And Steve, if they could turn this mall into a virtual Dawn of the Dead, with people dressed as zombies and you armed with a laser tag gun to take them out, I'd probably spend my life there. While Steve and I -- and a lot of other people -- might like to see "Target, Bed Bath & Beyond, and dare I say it...Pottery Barn," we have to remember that many people DON'T want that. They moved to SS because it was/is "funky...non-commercial...not like Bethesda." They will fight to keep it that way. And mainstream retailers know it -- so they don't bother with us. I've been told by various business types around here that SS is definitely "a hard sell" to the Pottery Barns of the world. And they know that those of us who buy their stuff will travel a few miles west to make the purchases. As much as a Target would make a lot of sense, wouldn't a hypothetical Target in City Place cannibalize the sales of the 5 other Targets within 10 miles of DTSS? I could see it replacing the Wheaton location given distance and that DTSS is a bit more desirable for them if such a thing happened. Okay, I really don't think a new office tower on top will ever materialize. It's probably some sort of smoke screen to keep county officials from stepping in...not that I would know. However, in Austin Tx, a movie house franchise business called Alamo Draft House, shows lots of different styles of movies, serves good to decent food during the movie with servers...and BEER, this seems to me...and maybe only to me as a way to get the quirky into the mix. After that clearly dumping the flotsam and jetsam of retailers in the mall would come next. I just think the Mall, in addition to a real face lift like the retail area on Pratt St in Baltimore, needs a real destination anchor store. Something at top and bottom to excite people to come in, and then of course to complain there is nothing else but cell phone kiosks and a gym with 20 members. But what do I know? I NEVER shop in CPM, there's nothing to buy! The last thing City Place needs is another movie theater, ad a draft house theater is worse. The last movie theater attracted a noisy crowd of young people that made the movie experience a non pleasuable experience. A draft house will make it worse- we dont need inebriated movie goers arguing with the people onthe screen. I would like to see some kind of Eastern market/Lexington market concept. A lot of stalls selling a variety of goods under one roof. It would save a lot of walking for some people. and offer the small business person an opportunity to sell local wares. It would take some pretty radical changes to remake City Place into any kind of viable retail. When it opened, the hype machine was in full gear, but most of the tenants, even in the beginning, were more teen-oriented (Sam Goody, AMC Theaters, young apparel, etc.) From there, a lot of the "name" retailers closed and the more low-rent, cheapo stores went in, some of them on short-term leases. I don't go to a mall to shop at dollar stores or get wigs. I stopped going about 3 years before the theaters closed, and if it weren't for the theaters, I probably wouldn't have set foot in there more than 4-5 times between 1992 and now. Frankly, I think that building would be much better suited to two or three large retailers, maybe Target, H&M and a "traditional" dept. store like Sears or Penney's. Not sure how realistic that is with the current economy, but whatever is done, they have to make it MORE upscale than Wheaton Plaza, not the same or less. That's what doomed City Place. I think there are enough people with money and/or "taste" that don't want to slog over to Bethesda to support higher-end retail in DTSS. Why is everyone so obsessed with Target as if its the end all and be all of retail? We already have dozens of Targets in the immediate area, you can't go two stops north to wheaton? Lazy people. We don't need Target in silver spring, don't even need shopping since we have several malls in the area. We just need City Place gutted out and made into offices and a hotel. End of story. No need for a 5 level indoor mall in an area where people clearly don't want to shop in.